For your convenience, you can purchase tickets online in advance of our upcoming show. We can only accept credit cards on our website. Adult tickets at the door will be $12. Tickets purchased at the door are to be paid by cash or check. Student tickets may only be purchased for those 11-18 years of age. Children 10 and younger are FREE! PLEASE NOTE: You will need to select the date of the performance when you purchase your ticket. If you would like to purchase more than one ticket, the quantity of tickets can be adjusted in the shopping cart. Simply click on the red "My Cart" button at the top right. You will receive a confirmation email from Paypal after your transaction is complete. Please print the confirmation email. This is your proof of purchase and must be presented to Will Call or at the Box Office the night of the performance. 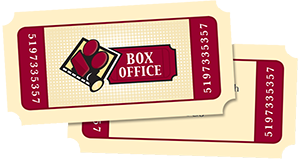 Your ticket invoice MUST match the date of the performance when you pick up your ticket(s) from Will Call.